Moving Again with Your Business? You know what to do, but you can’t find the focus. You’re motivated to reach your goals, but when it’s time to get moving, somehow it just doesn’t happen. You’re smart and you work hard, but it just isn’t happening. You’re not alone. Not remotely. You aren’t a flake or a loser — you’re just stuck. And being stuck is a very natural, normal part of being in business. More so now than ever. Getting stuck is normal. STAYING stuck is fatal. This is a tough time to be in business. More of us than ever are facing new problems and challenges. We’ve got a new culture, a new economy, new forms of communication, new technologies, a new pace of business. It’s all changing faster than we can keep track of it. And all of that means it’s easier to let fear freeze you, and easier to become so overwhelmed that you don’t know what to do next. But you still have bills to pay while all this craziness gets sorted out. The really crazy part is that as everything is shifting around, there’s more opportunity than there has been in generations. If you can learn to surf these waves, they can take you to amazing new places. A full roster of high-paying clients (and more than that, the kind of clients you actually enjoy spending time with). New business models that can take you farther and faster than you ever thought you could go. New ways of helping your clients that let you provide fantastic value and make a terrific living. But you’re not going to surf those waves if you’re standing on the beach paralyzed by fear. If you’re reading this page, you may be ready for Breakthrough Business Mastery For On Purpose Results, a brand-new business mindset and agility program. Well, Sonia Simone is a marketing and business teacher who knows where you are right now, because she’s been there herself. These days, she’s CMO and a founding partner of Copyblogger Media, a highly successful company that provides marketing tools and education to smart small businesses. But getting there wasn’t easy. Sonia has her own history of being stuck, confused, needing to move forward but caught like a “deer in the headlights.” She knows just where you are right now, and she wants to help you get moving again. Gary Barnes is a high performance business coach who has been putting businesses together for over 40 years, and he’s amazing at helping his clients get out of their “stuck spots” and getting some traction. Name any business problem, and Gary’s seen it. In his own businesses and in his clients’ businesses. And he’s developed an amazing toolbox to get through the fear and overwhelm and start moving again. Sonia and Gary have created a new program to help you become more agile in your business. Actually, it’s more like an extended coaching session. Breakthrough Business Mastery For On Purpose Results is a 13-week course on how to do for yourself what a premium business coach like Gary can do for you. Each week you’ll get an MP3 coaching session and an Action Step worksheet. The audio gives you a core concept or “how to” that you’ll want to master in order to move forward with your goals. The Action Step worksheet gets you out of theory and into doing something. There will also be a complete transcript of each session, if audio’s not your favorite way to learn. These are also great for review, since you can skim them quickly to find the point you want. As a Breakthrough Business Mastery For On Purpose Results member, you’re invited to email Gary twice a month to resolve any stuck spots or confusion you may have about what we’re working on. Gary will work with you individually to apply the program to your business and your situation. And if you choose, you can also supplement the program with a one-on-one coaching package with Gary. Some will choose this as the fastest way to move forward, and others are going to prefer to stick with the lower-cost option of working just with the course for now. There’s no wrong answer — both will get you where you want to go. Gary created this program around the coaching methodology that he’s developed over the years. He selected the topics that snag nearly all of us at one point or another. Each lesson is focused on specific techniques, not vague advice. We always spell out the next actions you need to take to move forward, with a specific timeline. The program lasts 13 weeks — one quarter. But we don’t expect you to go through the program just once. Each of the sessions is designed to help you not just now, but long into the future. If you really want to see breakthrough results, we suggest revisiting the program every quarter, focusing on the elements that are an issue for you at the time. Breakthrough Business Mastery For On Purpose Results is designed to give you the mindset tools and techniques to make you more flexible, more agile, more confident, and more successful. And these are tools you can continue to develop for a lifetime, if you like. Fear, of course, is the primary factor that gets us stuck in the first place, and in this session we’re tackling it head-on. We’ll learn how to do a simple triage process, how to identify what’s holding us back, and how to know the right thing to work on next. Do you make a lot of business plans but then fail to implement them? Don’t feel bad — almost everyone does. Gary will teach you how to anchor your plans in reality, and gives you simple but effective tools to make them happen. It seems so strange, but we’ve all felt it: Fear of success can hold us back in ways that fear of failure never does. This session will teach you how to know (not just feel) that you deserve success, and how to “elevate and separate” yourself for greater results. This session also includes Gary’s “three magic words” that will build your confidence and self-image. When you think about actually getting that ambitious project shipped and into the hands of customers, do you start to hyperventilate a little? That’s very natural. Sonia will teach you her favorite technique for moving from fear and overwhelm to “I did it!” This is the technique she uses to launch her successful projects, and you can do it too. Time management is one of the most difficult problems for all of us, but especially for those of us running businesses. Gary will walk you through his PINO system, and Sonia has a bonus lesson for you on the PINO time system for online entrepreneurs. Did you know you’ve got a “Little Genius” inside you? That Little Genius can sabotage your success (with procrastination, hidden fears, and “I-don’t-wanna” syndrome), but the Little Genius can also be the source of your richest and most meaningful success. We’ll learn how to harness the power of the Little Genius. This session continues our work in giving you a terrific life, not just a successful business. Because success without satisfaction is no way to spend the limited time we have on this amazing earth. Gary’s process doesn’t just give you amazing results, it’s also a lot of fun! Eventually you’ll want to quit being “chief cook and bottle washer,” and to bring others into your business to build your success. We’ll talk about different ways to leverage other people in your business, and how to work gracefully with employees and partners. Failure to effectively manage cash flow is one of the most common causes of failure in small (or large) businesses. Fortunately, you don’t need complex accounting systems or fancy monetary models. Gary shares his simple two-tier system for managing the ins and outs of cash flow. Too many business owners get into the habit of isolation. We try and “tough it out” on our own instead of reaching out. This session will give you practical tips for networking and connecting with others to build your business. Sonia will also include a bonus lesson on connection-based marketing. Session 13: Upward and onward! In week 13, we dive back into the key moments from Breakthrough Business Mastery For On Purpose Results, to be sure you’re focusing on the “80/20” highest-value activities. We’ll also prepare for how you can use the course going forward, so you can continue to benefit from the material over the next year or even longer. To help you stay on track with your sessions, you get two “Email Lifelines” with Gary every month. Having trouble clarifying your vision? Need an accountability coach to get that product shipped? Gary can help keep you moving so you keep progressing through the program. 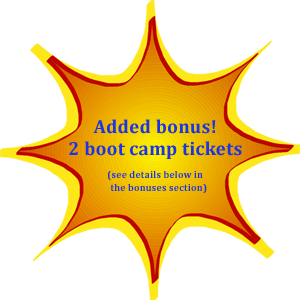 Iím also including as a bonus 2 tickets to attend any of my Maximize Your Business Now ìLIVEî boot camps in 2014 ($1994 value) absolutely FREE!! Get more information about the boot camp here. No online program is complete without some great bonuses, right? Bonus #1 Sonia Simone wants to offer you three marketing lessons from her Remarkable Marketing Blueprint course. The Blueprint focuses on powerful marketing techniques to bring customers in the door. That course is currently closed to new enrollment, so the only way to get this material today is by signing up for the On Purpose Results program. Breakthrough Business Mastery For On Purpose Results is not a marketing course, but of course, finding new customers and earning their trust is a major part of growing your business. These bonus sessions listed below will help you with that. Many of us know we need a good answer to the question, ìWhy should customers do business with you, out of all the other options they have today?î But that question can be pretty intimidating. This lesson is all about getting you out of that stuck spot. Everyone talks about content and social media marketing, but what do you do if writing isnít your thing? This lesson gives you three simple techniques you can use to create great content even if you really, truly hate to write. Youíll get this lesson once you have a few weeks of coaching under your belt, because this step can actually be a big jump! Youíll learn about the key technique that will start attracting the right kind of customer, and then the specific steps you can take to start creating a lifelong relationship with that customer. Bonus #2 Gary is including a 3 month membership into his MaxLife Group VIP Coaching Club. The first teleconference each month is topic driven where you will learn new ways to fine-tune your business for faster results. The second teleconference of the month is an open Q&A call where you’ll be able to ask Gary your specific questions either live on the call or by submitting your questions via e-mail. Gary wanted to create a program that made his work accessible to more people, and that allowed him to leverage his time and help as many people as possible. A complete 13-week program (MP3s, transcripts, and Action Step worksheets) to turn around your mindset, your business, and your life. Two “Email Lifeline” emails with Gary each month for the duration of the program, to help you implement the specifics of the program in your business. Click the button to reserve your spot and start seeing results today. Want to go further, faster with the program? Add a one-on-one coaching package with Gary for a special price (with purchase of the Breakthrough Business Mastery For On Purpose Results program only). Test drive the course for 30 days and see how it feels. I think you’re going to find that the information is solid, the worksheets will show you exactly what to do next, and that the material will help you focus on the precise steps you need to take to make great progress in your business. If you don’t agree, let us know within the first 30 days of your membership. We will be very happy to refund your payment, and we’ll part as friends. Having a business is about so much more than making money. It’s about making a satisfying life. About creating a sense of freedom and purpose. Breakthrough Business Mastery For On Purpose Results is designed to let you “be your own coach.” To learn greater agility. To have more fun with your business. To expand your mindset. And to make the world better while improving yourself. quit spinning your wheels, that you want to find some traction and get moving. We’re really excited to have you join us.